Obama extends U.S. troops’ Afghanistan combat presence. 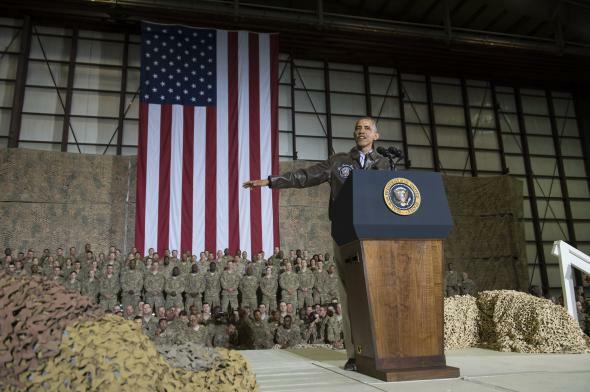 President Obama speaks during a surprise visit with troops at Bagram Air Field in Afghanistan in 2014. President Obama reversed course on his previous decision to end American troops’ combat role in Afghanistan by the end of the year. The classified order, the New York Times reports, will give American troops broader offensive capability in the country—including carrying out missions against the Taliban and broader support of the Afghan military—than first articulated by the President earlier this year. In an announcement in the White House Rose Garden in May, Mr. Obama said that the American military would have no combat role in Afghanistan next year, and that the missions for the 9,800 troops remaining in the country would be limited to training Afghan forces and to hunting the “remnants of Al Qaeda.” The decision to change that mission was the result of a lengthy and heated debate that laid bare the tension inside the Obama administration between two often-competing imperatives: the promise Mr. Obama made to end the war in Afghanistan, versus the demands of the Pentagon that American troops be able to successfully fulfill their remaining missions in the country. The internal discussion took place against the backdrop of this year’s collapse of Iraqi security forces in the face of the advance of the Islamic State as well as the mistrust between the Pentagon and the White House that still lingers since Mr. Obama’s 2009 decision to “surge” 30,000 American troops to Afghanistan. Some of the president’s civilian advisers say that decision was made only because of excessive Pentagon pressure, and some military officials say it was half-baked and made with an eye to domestic politics. Mr. Obama’s decision, made during a White House meeting in recent weeks with his senior national security advisers, came over the objection of some of his top civilian aides, who argued that American lives should not be put at risk next year in any operations against the Taliban—and that they should have only a narrow counterterrorism mission against Al Qaeda. But the military pushed back, and generals both at the Pentagon and in Afghanistan urged Mr. Obama to define the mission more broadly to allow American troops to attack the Taliban, the Haqqani network and other militants if intelligence revealed that the extremists were threatening American forces in the country.